Punjab Chief Minister Captain Amarinder Singh presented Maharaja Ranjit Singh Awards to 123 outstanding sportspersons from Punjab at a glittering function held at AKM Resort here this evening. Punjab sportspersons after receiving the Maharaja Ranjit Singh Award at a function in Zirakpur on Saturday. The biggest prize in sport deserved to be handled better. It has been less than a week since Italy’s penalty shootout victory over France in Berlin, but the coveted trophy is no longer in one piece. Pakistan batsman Mohammed Yousuf struck his 17th Test century today with an unbeaten 185 on the third day of the first Test against England at Lord’s. At the close, Pakistan were 409 for seven wickets in reply to England’s 528 for nine declared. Brian Lara was retained as captain after the West Indies Cricket Board bowed down to his threat that he would quit if changes were not made in the selection panel. West Bengal Sports Minister Subhas Chakraborty today openly backed Cricket Association of Bengal president Jagmohan Dalmiya and said efforts were afoot to work out a compromise between the two rival factions ahead of the July 30 CAB elections. The BCCI is all set to rope in IT giant Microsoft for software solutions that will evaluate and help improve the performances of its umpires. “The deal is not finalised yet, but we are in the final stages of negotiations with Microsoft,” BCCI Marketing Sub-committee Chairman Lalit Modi told reporters here today. Ms Rajbir Kaur, judo coach who beat up her superior in full public view on Thursday, has levelled serious charges against Mr Mangat Goel, Assistant Director (Administration), whom she had bashed up on the premises of the National Institute of Sports here. 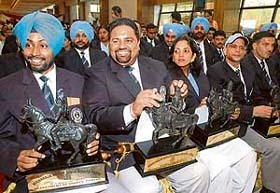 Captain Amarinder Singh had announced the revival of the awards during the first Indo-Pak Punjab Games in 2004. It was after a gap of 10 years that these awards were presented today. The awardees were selected from 1997 to 2004. The awards was instituted in 1978 and discontinued in 1996. With today’s presentation, 237 players have received the Maharaja Ranjit Singh Awards. The recipients were loudly cheered when they were called on the dais to receive the prestigious awards which carried a cheque for Rs 1 lakh, a trophy of Maharaja Ranjit Singh and citation, besides a blazer and a tie. Olympian Pargat Singh was the first one to get the award. However, all the four cricketers shortlisted for the awards — Yuvraj Singh, Harbhajan Singh, Dinesh Mongia and Reetinder Sodhi — did not turn up. Giving sops to the sportspersons serving in Punjab Police, Captain announced that as many as 337 ex-cadre posts will be regularised very soon without affecting the avenues of general category. A separate 5 per cent C-2 quota will be reserved for their promotion purpose, said the Chief Minister. He also said the next edition of Indo-Pak Punjab Games will be held in the October-November. The awardees: Hockey: Baljit Singh Dhillon, Pargat Singh, Sanjeev Kumar Dang, Gagan Ajit Singh, Baljit Singh Chandi, Jugraj Singh, Prabhjot Singh, Kanwalpreet Singh, Manjinder Kaur Dhindsa, Daljit Singh Dhillon, Deepak Thakur, Tejvir Singh, Ramandeep Singh, Baljit Singh Saini, Amandeep Kaur. Badminton: Vijaydeep Singh, Sachan Ratti. Table Tennis: Kanchan Dhawan Basak. Judo: Narinder Singh, Jagjeet Kaur, Ashwini Kumar, Jai Pal, Bhupinder Singh, Pawan Kumar, Pankaj Sharma, Rashmi Rani. Wrestling: Mukesh Kumar, Kehar Singh, Jagjit Singh, Jagdish Singh Bhola, Shamsher Singh, Krishan Kumar, Karamvir Singh, Rajinder Singh, Palwinder Singh Cheema, Ranbir Singh, Satish Kumar, Amandeep Sondhi, Gursharanpreet Kaur, Sarwar Singh, Gurbinder Singh, Pawan Kumar Cycling: Pardeep Singh, Kulbir Singh Bhangu, Ramninder Singh Deol, Hitraj Singh, Sukhjinder Singh, Pavittar Singh, Amandeep Singh, Kanwarjit Singh. Basketball: Parminder Singh (Jr), Pritpal Singh, Gagnesh Kumar, Parminder Singh Sr, Vipin Kumar, Gursharanjit Singh, Prabhjot Kaur Gill, Ashish Arun Gill. Handball: Satwinderpal Singh, Gurpreet Kaur Purewal, Indu Bala, Rajnish Kumar, Mukesh Sharma, Kulwinder Singh, Harvinder Kaur, Karamjit Kaur, Jaswant Singh, Karamjit Singh. Athletics: Surinder Kaur, Ajay Raj Singh, Harwant Kaur, Madhuri A Singh, Manjit Kaur, Navpreet Singh, Jasmine Kaur, Sagardeep Kaur, Karamjit Kaur, Gurpreet Singh, Amarjit Singh, Sapinder Singh, Jagdev Singh Waraich, Daljit Singh, Harbans Kaur, Harjit Kaur, Bahadur Singh, Paramjit Singh, Sunita Rani, Swarnjit Kaur, Jagdish K Bishnoi. Volleyball: Manoj Kumar, Rattan Lal, Surjit Singh, Roy Joseph, Pritpal Singh, Jagbir Singh. Gymnastics: Rajinder Parshad, Rajini Sharma, Jaswant Kaur. Weightlifting: Manjit Singh, Vicky Batta, Geeta Rani, Sandeep Kumar, Dalbir Singh. Shooting: Abhinav Bindra, Birendeep Sodhi, Santokh Singh, Annudeep Singh Sandhu, Ranjan Sodhi, Manav Jit Singh Sandhu, Zoravar Singh Sodhi. Cricket: Reetinder Singh Sodhi, Harbhajan Singh, Yuvraj Singh, Dinesh Mongia. Equestrian: Jagdish Singh, Satpal Singh. Boxing: Bhim Singh, Karamjit Kaur, Harpreet Singh, Harpal Singh. Now that the dust has settled on the World Cup extravaganza, it’s time to reflect on the tournament and why football, which is such a popular game, is languishing in India, a country of a billion people. Sadly, after all the wild enthusiasm shown by India’s football-crazy fans, they had more disappointing news. FIFA, football’s governing body, has just further downgraded India from an abysmal 117 to 130th position. It always hurts to see India nowhere in the biggest stage of world soccer. But that’s bound to be. When I see that the other countries spend more than 100 times of money and energy than India to develop football, my sadness gives way to frustration. The standards of the game is such in our country that it is now too much to expect India to make the cut in the immediate future I think India has not been able to make much of an impression at the international stage because of the present set-up. We have to be more professional in our approach and only then can we make some progress. What we urgently need is good coaches at all levels. It is absolutely imperative to have quality coaches not only at the top level but at the grassroot level also. The lack of quality coaches has been one of the reasons why India has not been able to unearth talent. I am sure there is ample talent at the grassroot level, but we should have a mechanism to discover those players. It is time we take remedial measures. Of course, we cannot expect the results to come overnight. But atleast we should have a system in place which can produce results. I feel touched by the All India Football Federation (AIFF) President Priya Ranjan Dasmunsi’s statement that he would like me to come back to the Indian team. I will wait for the team to come back from the tournament in Canada before taking a final decision. I will have a discussion with the coach and AIFF officials before I make up my mind. To go back to the World Cup, it was marked by some excellent football and many upsets. One of the abiding images of this Cup sadly will be of Zinadine Zidane’s head-butting of Marco Materazzi. Italy may have won the World Cup, but I think Materazzi is a loser. The Azurri defender scored two important goals, but besmirched his reputation by the manner in which he provoked Zidane. Though it was a tactical ploy, I feel good players will never provoke opponents in the way Materazzi did. They will let their skills speak for themselves. One would have expected Materazzi to be high on confidence after striking twice for the eventual champions during the tournament. But instead, the Italian’s inferiority complex showed in the way he abused Zidane. However, I do not hold any brief for Zidane. I am not trying to defend him for the head-butting incident. Zidane should have remembered that he was playing the World Cup final, and his side needed him so much. He should have kept his cool, and not reacted in such a manner. I have myself been in similar situations as Zidane. These things happen in soccer. But again, good players in India do not behave like Materrazi. I hear that FIFA is conducting an investigation into the incident, and Zidane may be stripped of the golden ball award if found guilty. I find this surprising. Zidane was chosen for the award by the world’s leading soccer journalists who had gone to cover the World Cup. He was selected for his extraordinary performance. If FIFA wanted to have a say on this, then it should in the first place have laid down a set of clear-cut rules to be adhered to before deciding on the award. It should have appointed an expert panel as the jury. FIFA had never said beforehand that a player could not be considered for the award on disciplinary grounds. So, why is FIFA now trying to intervene in a matter which has been decided by journalists? Also, there are age-old provisions for punishing on-field misbehaviour with yellow and red cards. Zidane had to leave the field after being given marching orders. Now, if he is deprived of the golden ball award, then it will amount to double punishment. What a great tournament Zidane had! Ten or 15 years from now, when people talk of the 2006 world Cup, they will talk of only Zidane. After 1986, when Maradona stole the show with his magical performance, no other player has dominated a World Cup as much as Zidane did this time. Even the entire build-up to the July 9 final was around Zidane. It was billed more as a clash between Zidane and Italy, than between France and Italy. So, the head-butting incident cannot belittle Zidane’s role in the World Cup, though France may have finished runners up to Italy. I was not at all surprised by Italy’s success. I had expected them to win. Teams with strong defences have done well in the tourney. A side like Italy, that boasts of a host of outstanding defenders, is always at an advantage. On the other hand, Brazil’s showing was very disappointing. The eternal favourites of the World Cup never got their touch. They never really hit upon the right playing combination. Ronaldo got three goals, but he was nowhere near to even 50 per cent of his prime form. An injury-free Ronaldo is still deadly, but he was not fully fit. And it showed. Another disappointing feature is that none of the Asian teams could make it past the opening round. After the heady success of the last edition, when co-hosts Japan and Korea did so well, the latest version must have come as a major embarrassment for the continent’s football bosses. However, the script may be different when the Cup moves to South Africa after four years. I expect the African teams to do better. They may not finish champions, but can advance further than they did this year and pose a few problems for the top sides. But on the whole, I enjoyed World Cup 2006. It was a neatly organised event. The general soccer standards were good. Apart from Trinidad and Tobago, all other sides scored. The biggest prize in sport deserved to be handled better. It has been less than a week since Italy’s penalty shootout victory over France in Berlin, but the coveted trophy is no longer in one piece. Pictures on the front page of Italian newspaper ‘Il Messaggero’ showed skipper Fabio Cannavaro staring at the Cup, then holding up what appeared to be a piece of green malachite that has broken off its base. When the picture was taken, Cannavaro was sitting on the Italian team bus when on his way to visit Gianluca Pessotto, the former Juventus player who is in hospital in Turin after falling from a window of the club’s offices during the tournament. The piece may have come off the trophy on the bus, according to the newspaper which also claimed it was later fixed up with glue. The Italian captain admitted that he slept with the trophy on the night of winning the final, ‘Sydney Morning Herald’ reported. The World Cup triumph was supposed to be a boon for Italy, struggling to come to terms with the Serie A match-fixing scandal involving four of the biggest clubs in the country. But one would not think that way considering the way the world champions treated the coveted trophy. It is all the more ironical that the trophy was created by Italian artist Silvio Gazzaniga for the 1974 World Cup after Brazil took home the original Jules Rimet Trophy following their third World Cup triumph in Mexico in 1970. The 14-inch high trophy is made of solid 18 carat gold and shows two athletes spiralling out from the base to hold the world in their hands. There are two layers of malachite on the base, which has room for 17 plaques to display the names of the winners. Pakistan batsman Mohammed Yousuf struck his 17th Test century today with an unbeaten 185 on the third day of the first Test against England at Lord’s. At the close, Pakistan were 409 for seven wickets in reply to England’s 528 for nine declared. Yousuf stroked 24 fours and a six and has now been at the crease for seven hours. 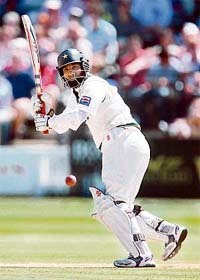 Captain Inzamam-ul-Haq scored 69, Abdul Razzaq collected 22 and wicketkeeper Kamran Akmal struck 58 before becoming Kevin Pietersen’s first Test victim. Formerly known as Yousuf Youhana before he converted to Islam last year, Yousuf reached his maiden century in England with 15 boundaries from 157 balls. Possibly the most stylish player in a team crammed with elegant stroke-makers, he averaged 68.40 against the same opponents in the three-match series late last year, scoring 223 in Pakistan’s innings victory in the third Test in Lahore. Captain Inzamam-ul-Haq was the only batsman to fall in the afternoon session when he was bowled by Liam Plunkett for 69. Earlier, Pakistan lost nightwatchman Mohammad Sami for a duck in the second over of the day’s play after resuming on 66 for three with Yousuf on 20. Matthew Hoggard caught the edge of Sami’s bat with his fourth delivery and the ball flew to acting captain Andrew Strauss at second slip. England appealed for the catch but, after consulting with his fellow umpire Simon Taufel, Steve Bucknor confirmed the ball had bounced. Sami got another edge to the second ball and this time Geraint Jones completed the catch behind the stumps, moving to his right. Steve Harmison, who took two wickets in three balls on Friday evening, beat Yousuf for pace flashing outside the off stump. He then bounced the new batsman Inzamam and Hoggard also bowled several short-pitched deliveries to the Pakistan captain with two men back for the hook. Inzamam got off the mark with a sumptuous off drive off Hoggard and Yousuf accumulated runs steadily with deft deflections and flashing cover drives, including one off Harmison which raced to the boundary before the bowler had completed his follow-through. Harmison should have had a third wicket when Inzamam was on 17 and the total 110 but Marcus Trescothick was unable to hold a sharp chance to his right hand. Fall of wickets: 1-28, 2-28, 3-65, 4-68, 5-241, 6-300, 7-399. Claiming that injustice was being done to Dalmiya by the BCCI, which has filed an FIR against the CAB chief for alleged misappropriation of funds relating to the 1996 World Cup, Chakraborty said, “I have protested against this discrimination. “First they said that the amount misappropriated was Rs 21 lakh. Then it went up to Rs 5.67 crore and subsequently to Rs 21 crore. Now they say it is Rs 40 crore. I won’t be surprised if a few days later the sum shoots up to Rs 100 crore,” Chakraborty said. “Their inconsistent stand proves they are meting out injustice to Dalmiya. How can a responsible organisation act like this?” the minister asked. Chakraborty’s support to Dalmiya is significant in view of Chief Minister Buddhadev Bhattacharjee’s public statement that he was in favour of Dalmiya opting out of the CAB presidential contest. The anti-Dalmiya faction has announced City Police Commissioner Prasun Mukherjee as its presidential candidate with the apparent backing of Bhattacharjee. Chakaraborty said he had written a protest letter to BCCI president Sharad Pawar against the decision to extend tenure of the board’s office-bearers by one year to two years from September when its annual elections are held. A BCCI Special General Meeting last month also included the provision that the office-bearers could be re-elected for an additional year. “This is undemocratic. Just because they have the majority they can’t do it. This is unethical,” Chakraborty said. The minister revealed that he was trying for a ‘respectable compromise’ acceptable to both the factions with regard to the CAB elections. “For an amicable settlement, both sides need to be flexible in their stand,” he said. Chakraborty had earlier met Dalmiya to convey the Chief Minister’s request that he should stay away from the elections. The BCCI is all set to rope in IT giant Microsoft for software solutions that will evaluate and help improve the performances of its umpires. “The deal is not finalised yet, but we are in the final stages of negotiations with Microsoft,” BCCI Marketing Sub-committee Chairman Lalit Modi told reporters here today. “We zeroed in on Microsoft after looking at several technological solutions,” Modi, also a Vice-President of the BCCI, said. Microsoft’s task will be to provide a software that will help evaluate the performances of the men in white coat whose every decision in the domestic circuit will be under scrutiny from the next season. Reports emanating from the NIS, however, say that the coach has even gone to the extent of levelling sexual harassment charges against the AD. But this could not be confirmed since no senior NIS official was available for comment. The coach had on an earlier occasion entered into a scuffle with another women SAI coach following which judo coaches employed in the Centre of Excellence and SAI Training Centre (STC) had complained in written to the authorities about the eccentric behaviour of Ms Rajbir Kaur. A senior NIS official said Mr Goel had recorded an official noting on a file on June 21 that Ms Rajbir Kaur had allegedly threatened him. He said the coach wanted to change her name from Ms Rajbir Kaur to Ms Rosi Jamwal and then again to Ms Rajbir Kaur which was not allowed under government rules. According to rules if at all the coach, who at one stage was taken of from coaching duties and was assigned a duties in the NIS Library and the institute’s techno gym, had to get her name changed for the third time it was mandatory on her part to produce a divorce certificate. However, insiders reveal that despite failing to produce the divorce papers she still insisted on getting her name changed on the official files. Meanwhile, an NIS official confirmed that Ms Rajbir Kaur had once requested Mr Mangat Goel to let her withdraw Rs 3 lakh from her GP funds, citing the fact that she needed the money for her sister’s marriage. However, when she was asked to produce the dependency certificate, which is mandatory under the rules, she flared up at the AD, picking up a quarrel with him. 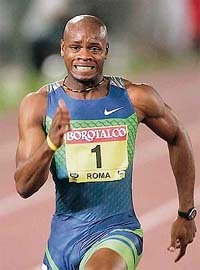 Jamaica’s Asafa Powell on his way to victory in the men’s 100m race during the Golden Gala IAAF meeting in Rome on Friday.